Hi everyone! 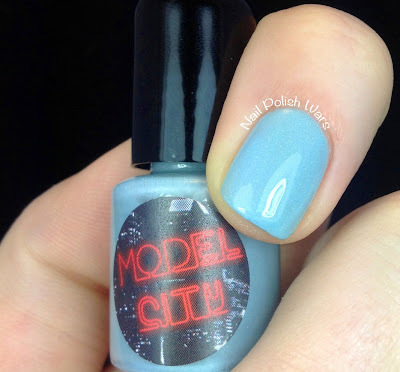 I have some awesome Model City polishes to show you today!! Cookies and Milk is a white creme loaded with black and gold hexes. The formula was a bit thin, but relatively easy to apply. Shown is three coats of Cookies and Milk. Pretty in Pink is a very pretty petal pink holographic. The formula was smooth and easy to apply. 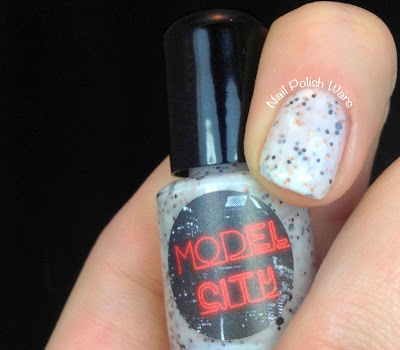 I adore the shade of this one, but the holo strength was very weak. I couldn't seem to get the rainbows to pop out even in the sunlight. Shown is two coats of Pretty in Pink. 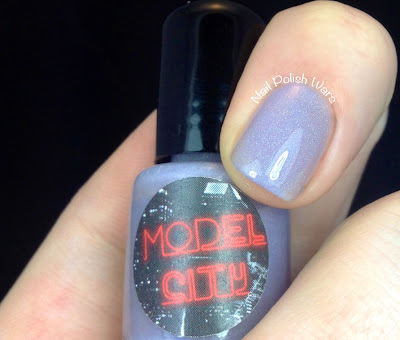 I Lilac What You Did There is a delicate lilac purple holographic. The formula was smooth and easy to apply. Again, the holo strength was very weak. Shown is two coats of I Lilac What You Did There. 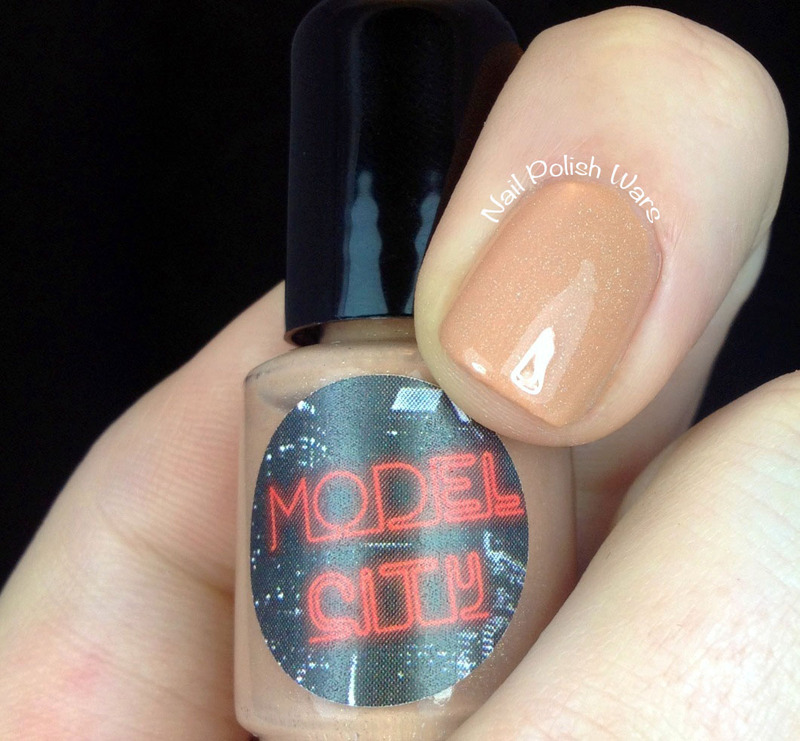 Orange You Just Peachy is a pale orange holographic with a slight tan undertone. The formula was smooth and easy to apply. Again, the holo strength was very weak. Shown is two coats of Orange You Just Peachy. You Blue Me Away is a soft but bright blue holographic. The formula was smooth and easy to apply. As with the others, the holo strength was very weak. Shown is two coats of You Blue Me Away. Anti Establish Mint is a pale green holographic. The formula was smooth and easy to apply. Once again, the holo strength was very weak. Shown is two coats of Anti Establish Mint. 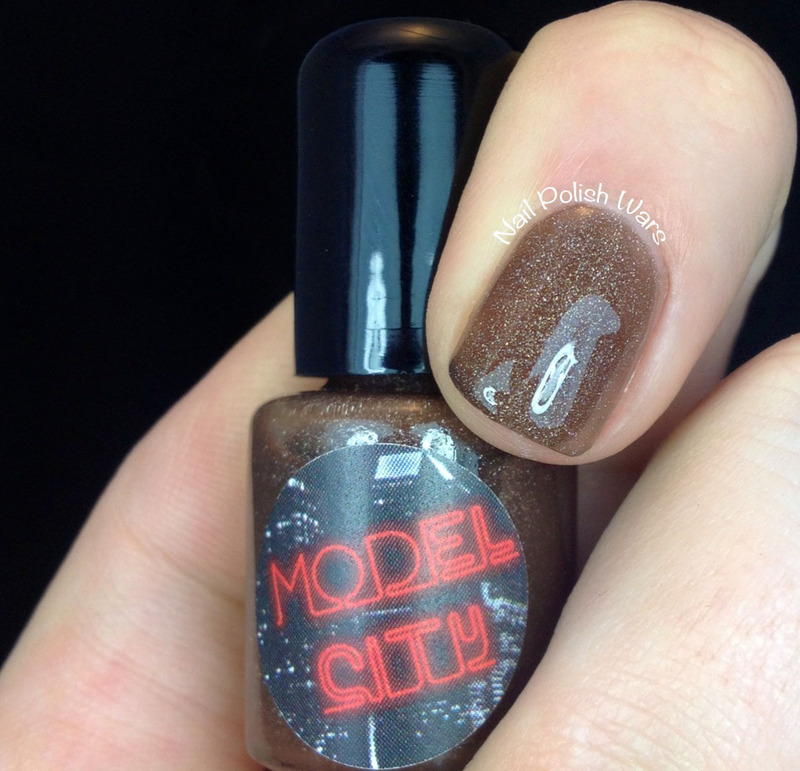 Dipping Chocolate is a soft brown holographic. The formula was smooth and easy to apply. The holographic strength was a bit better in this one, which made for a more sparkling finish, but still didn't flash the rainbows. Shown is two coats of Dipping Chocolate. Overall, I absolutely adore these soft shades, but I really wish the holographic strength was a little stronger. You can find Model City polish at their store page here, and be sure to check them out on Facebook for all of their latest updates. I really like the brown one! So pretty.